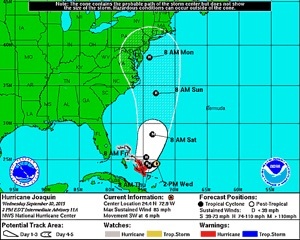 Please be assured the marina we are in is considered a safe hurricane hole in that it is protected on 3 sides by land. Our slip is tucked in the back of the marina even more protected than most – although our dock itself is old and in my opinion questionable of surviving any storm without some damage to the dock with any significant surge or very high tides. Storms like this often change course and intensity and are not truly predictable until closer to the encounter, but the next two days are scheduled to be 90 – 100% chance of rain (unrelated to the hurricane), so rather than wait and have to do it in the rain and wind, we opted to prepare the boat today. This meant doubling up all 4 points of dock lines and adding 4 spring lines (2 from front pilings to mid boat and 2 from dock pilings to mid boat). Yeap this meant yet another run to the local West Marine for more dock lines. We have added fenders to both sides of the boat in case of rubbing against pilings and/or docks. We have also removed all the canvas from the boat (the new dodger, windshield (windscreen) and cockpit cover) as well as seat cushions, etc. We have secured everything/anything else from above deck that may blow. If the storm worsens or tracks in such a way as to cause us more concern we will remove the sails as well, but at this point we are hoping not to have to do that. We will keep you posted as/if the storm comes through. We expect to spend the next few days snuggled down in the cabin below with our new air conditioning running (if necessary and for as long as it is safe to have the power plugged in) and enjoying some quality one on one time with each other.